This black folding knife from Schrade gives you a black titanium coated drop point blade that can slice through tasks with ease. 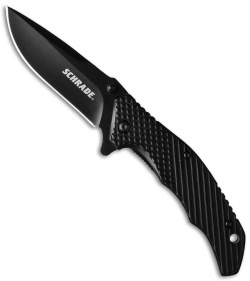 Made of 9Cr18MoV high carbon stainless steel, this blade will hold up to whatever you've got to throw at it. The black titanium coated stainless steel handle features a textured grip that looks as good as it feels in your hand. The sculpted handle and jimping on the spine make sure your grip stays secure even in less than perfect conditions. 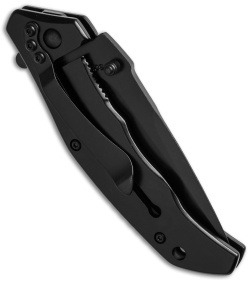 You can use the ambidextrous thumb studs or the index flipper for quick opening, and the frame lock will hold the blade securely while you work. There is a lanyard hole for adding a bit of customization, and the tip-down carry pocket clip means you'll always have this tool close at hand.